Don’t miss out on classes for the rest of the summer! We’re visiting some of our favorite tracks, as well as a new one. 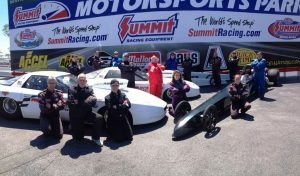 Our Super Comp & Super Gas classes, as well as our Dragster Adventure programs have been filling quickly, so don’t wait. Give Jeff Arend (x103) or Paul Shields (x102) a call at 866-480-7223 to reserve your seat now. Advance reservations are required and seats are limited, so whether you want to earn your competition license, bring your own car to improve or upgrade your skills, or just have some fun, we’d love to help you. You’ll learn so much more in the 2-day competition course than how to drive a race car. Here’s a list of the upcoming school classes that still have some openings. Maple Grove Raceway, Reading, PA August 25 Dragster Adventure — Click here to book now! Heartland Park, Topeka, KS September 9 Dragster Adventure — Click here to book now! Gateway Motorsports Park St. Louis, MO September 16 Dragster Adventure — Click here to book now!